Long Sleeve Swing Dress is rated 4.4 out of 5 by 9. Update your spring wardrobe with the Chain Print Long-Sleeved Swing Dress. 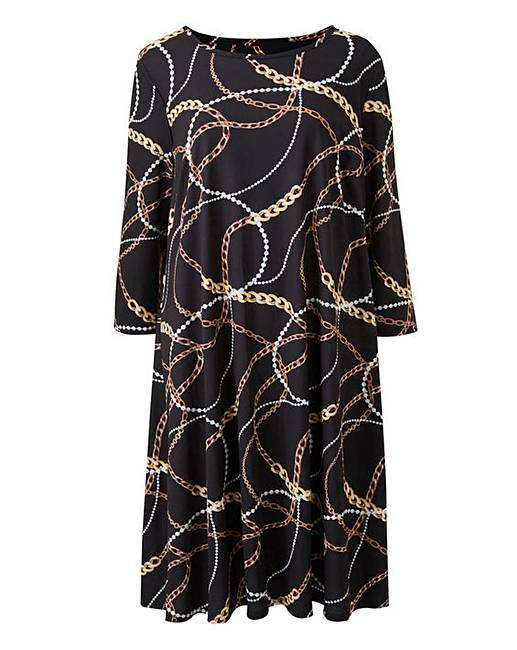 This gorgeous dress is cut to a flattering swing shape featuring long sleeves and is made from a soft stretchy jersey fabric that is adorned in a trendy chain print. Pair with some stylish ankle or knee- high boots to complete this effortlessly beautiful look. Rated 5 out of 5 by Sue from Swing dress True to size, comfortable to wear. Great quality, washed well. Very smart. Wear with leggings. Good price. Rated 5 out of 5 by maz from Love the style Got this last week, great comfortable fit, looks good with leggings.ordered another different pattern. Rated 4 out of 5 by Susie from Up to date. Really fits well,very comfortable but i thought it would be longer it must be really short on taller gals-it comes above my knee and I’m only 5foot 1inch. Rated 2 out of 5 by CDms from BOBBLE I love this type of dress, so easy to wear, great for work or with a denim jacket over. However, I have only worn and washed this once and it has already bobbled at the front.........bit dissapointing. Rated 5 out of 5 by Jules from Love this item ! Very comfy..... Friends have complemented me on this outfit good value for the money.